A biblical canon or canon of scripture is a set of texts (or "books") which a particular religious community regards as authoritative scripture. The English word "canon" comes from the Greek κανών, meaning "rule" or "measuring stick". Christians became the first to use the term in reference to scripture, but Eugene Ulrich regards the idea as Jewish. Most of the canons listed below are considered by adherents "closed" (i.e., books cannot be added or removed), reflecting a belief that public revelation has ended and thus some person or persons can gather approved inspired texts into a complete and authoritative canon, which scholar Bruce Metzger defines as "an authoritative collection of books". In contrast, an "open canon", which permits the addition of books through the process of continuous revelation, Metzger defines as "a collection of authoritative books". Rabbinic Judaism (Hebrew: יהדות רבנית) recognizes the twenty-four books of the Masoretic Text, commonly called the Tanakh (Hebrew: תַּנַ"ךְ) or Hebrew Bible. Evidence suggests that the process of canonization occurred between 200 BC and 200 AD, and a popular position is that the Torah was canonized c. 400 BC, the Prophets c. 200 BC, and the Writings c. 100 AD perhaps at a hypothetical Council of Jamnia—however, this position is increasingly criticised by modern scholars. According to Marc Zvi Brettler, the Jewish scriptures outside the Torah and the Prophets were fluid, different groups seeing authority in different books. The book of Deuteronomy includes a prohibition against adding or subtracting (4:2, 12:32) which might apply to the book itself (i.e. a "closed book", a prohibition against future scribal editing) or to the instruction received by Moses on Mt. Sinai. The book of 2 Maccabees, itself not a part of the Jewish canon, describes Nehemiah (c. 400 BC) as having "founded a library and collected books about the kings and prophets, and the writings of David, and letters of kings about votive offerings" (2:13–15). The Book of Nehemiah suggests that the priest-scribe Ezra brought the Torah back from Babylon to Jerusalem and the Second Temple (8–9) around the same time period. Both I and II Maccabees suggest that Judas Maccabeus (c. 167 BC) likewise collected sacred books (3:42–50, 2:13–15, 15:6–9), indeed some scholars argue that the Jewish canon was fixed by the Hasmonean dynasty. However, these primary sources do not suggest that the canon was at that time closed; moreover, it is not clear that these sacred books were identical to those that later became part of the canon. The Great Assembly, also known as the Great Synagogue, was, according to Jewish tradition, an assembly of 120 scribes, sages, and prophets, in the period from the end of the Biblical prophets to the time of the development of Rabbinic Judaism, marking a transition from an era of prophets to an era of Rabbis. They lived in a period of about two centuries ending c. 70 AD. Among the developments in Judaism that are attributed to them are the fixing of the Jewish Biblical canon, including the books of Ezekiel, Daniel, Esther, and the Twelve Minor Prophets; the introduction of the triple classification of the oral Torah, dividing its study into the three branches of midrash, halakot, and aggadot; the introduction of the Feast of Purim; and the institution of the prayer known as the Shemoneh 'Esreh as well as the synagogal prayers, rituals, and benedictions. In addition to the Tanakh, mainstream Rabbinic Judaism considers the Talmud (Hebrew: תַּלְמוּד ) to be another central, authoritative text. It takes the form of a record of rabbinic discussions pertaining to Jewish law, ethics, philosophy, customs, and history. The Talmud has two components: the Mishnah (c. 200 AD), the first written compendium of Judaism's oral Law; and the Gemara (c. 500 AD), an elucidation of the Mishnah and related Tannaitic writings that often ventures onto other subjects and expounds broadly on the Tanakh. There are numerous citations of Sirach within the Talmud, even though the book was not ultimately accepted into the Hebrew canon. The Talmud is the basis for all codes of rabbinic law and is often quoted in other rabbinic literature. Certain groups of Jews, such as the Karaites, do not accept the oral Law as it is codified in the Talmud and only consider the Tanakh to be authoritative. Another version of the Torah, in the Samaritan alphabet, also exists. This text is associated with the Samaritans (Hebrew: שומרונים; Arabic: السامريون), a people of whom the Jewish Encyclopedia states: "Their history as a distinct community begins with the taking of Samaria by the Assyrians in 722 BC." The Samaritan Pentateuch's relationship to the Masoretic Text is still disputed. Some differences are minor, such as the ages of different people mentioned in genealogy, while others are major, such as a commandment to be monogamous, which only appears in the Samaritan version. More importantly, the Samaritan text also diverges from the Masoretic in stating that Moses received the Ten Commandments on Mount Gerizim—not Mount Sinai—and that it is upon this mountain (Gerizim) that sacrifices to God should be made—not in Jerusalem. Scholars nonetheless consult the Samaritan version when trying to determine the meaning of text of the original Pentateuch, as well as to trace the development of text-families. Some scrolls among the Dead Sea scrolls have been identified as proto-Samaritan Pentateuch text-type. Comparisons have also been made between the Samaritan Torah and the Septuagint version. Samaritans consider the Torah to be inspired scripture, but do not accept any other parts of the Bible—probably a position also held by the Sadducees. They did not expand their canon by adding any Samaritan compositions. There is a Samaritan Book of Joshua; however, this is a popular chronicle written in Arabic and is not considered to be scripture. Other non-canonical Samaritan religious texts include the Memar Markah (Teaching of Markah) and the Defter (Prayerbook)—both from the 4th century or later. 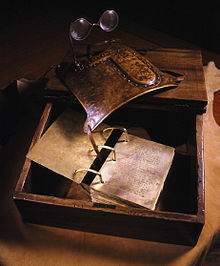 The Early Church used the Old Testament, namely the Septuagint (LXX) among Greek speakers, with a canon perhaps as found in the Bryennios List or Melito's canon. The Apostles did not otherwise leave a defined set of new scriptures; instead, the New Testament developed over time. Writings attributed to the apostles circulated among the earliest Christian communities. The Pauline epistles were circulating in collected forms by the end of the 1st century AD. Justin Martyr, in the early 2nd century, mentions the "memoirs of the Apostles", which Christians (Greek: Χριστιανός) called "gospels", and which were considered to be authoritatively equal to the Old Testament. Marcion of Sinope was the first Christian leader in recorded history (though later considered heretical) to propose and delineate a uniquely Christian canon (c. AD 140). This included 10 epistles from St. Paul, as well as a version of the Gospel of Luke, which today is known as the Gospel of Marcion. By doing this, he established a particular way of looking at religious texts that persists in Christian thought today. After Marcion, Christians began to divide texts into those that aligned well with the "canon" (measuring stick) of accepted theological thought and those that promoted heresy. This played a major role in finalizing the structure of the collection of works called the Bible. It has been proposed that the initial impetus for the proto-orthodox Christian project of canonization flowed from opposition to the canonization of Marcion. By the early 3rd century, Christian theologians like Origen of Alexandria may have been using—or at least were familiar with—the same 27 books found in modern New Testament editions, though there were still disputes over the canonicity of some of the writings (see also Antilegomena). Likewise by 200, the Muratorian fragment shows that there existed a set of Christian writings somewhat similar to what is now the New Testament, which included four gospels and argued against objections to them. Thus, while there was a good measure of debate in the Early Church over the New Testament canon, the major writings were accepted by almost all Christians by the middle of the 3rd century. Origen of Alexandria (184/85–253/54), an early scholar involved in the codification of the Biblical canon, had a thorough education both in Christian theology and in pagan philosophy, but was posthumously condemned at the Second Council of Constantinople in 553 since some of his teachings were considered to be heresy. Origen's canon included all of the books in the current New Testament canon except for four books: James, 2nd Peter, and the 2nd and 3rd epistles of John. He also included the Shepherd of Hermas which was later rejected. The religious scholar Bruce Metzger described Origen's efforts, saying "The process of canonization represented by Origen proceeded by way of selection, moving from many candidates for inclusion to fewer." This was one of the first major attempts at the compilation of certain books and letters as authoritative and inspired teaching for the Early Church at the time, although it is unclear whether Origen intended for his list to be authoritative itself. In his Easter letter of 367, Patriarch Athanasius of Alexandria gave a list of exactly the same books that would become the New Testament–27 book–proto-canon, and used the phrase "being canonized" (kanonizomena) in regard to them. Athanasius also included the Book of Baruch, as well as the Letter of Jeremiah, in his Old Testament canon. However, from this canon, he omitted the Book of Esther. The Eastern Churches had, in general, a weaker feeling than those in the West for the necessity of making sharp delineations with regard to the canon. They were more conscious of the gradation of spiritual quality among the books that they accepted (for example, the classification of Eusebius, see also Antilegomena) and were less often disposed to assert that the books which they rejected possessed no spiritual quality at all. For example, the Trullan Synod of 691–692, which Pope Sergius I (in office 687-701) rejected (see also Pentarchy), endorsed the following lists of canonical writings: the Apostolic Canons (c. 385), the Synod of Laodicea (c. 363), the Third Synod of Carthage (c. 397), and the 39th Festal Letter of Athanasius (367). And yet, these lists do not agree. Similarly, the New Testament canons of the Syriac, Armenian, Georgian, Egyptian Coptic and Ethiopian Churches all have minor differences, yet five of these Churches are part of the same communion and hold the same theological beliefs. The Revelation of John is said to be one of the most uncertain books; it was not translated into Georgian until the 10th century, and it has never been included in the official lectionary of the Eastern Orthodox Church, whether in Byzantine or modern times. The first Council that accepted the present Catholic canon (the Canon of Trent of 1546) may have been the Synod of Hippo Regius in North Africa (393). A brief summary of the acts was read at and accepted by the Council of Carthage (397) and the Council of Carthage (419). These Councils took place under the authority of St. Augustine (354-430), who regarded the canon as already closed. Pope Damasus I's Council of Rome in 382, if the Decretum Gelasianum is correctly associated with it, issued a biblical canon identical to that mentioned above. If not, the list is at least a 6th-century compilation. Likewise, Damasus' commissioning of the Latin Vulgate edition of the Bible, c. 383, proved instrumental in the fixation of the canon in the West. In a letter (c. 405) to Exsuperius of Toulouse, a Gallic bishop, Pope Innocent I mentioned the sacred books that were already received in the canon. When these bishops and Councils spoke on the matter, however, they were not defining something new, but instead "were ratifying what had already become the mind of the Church". [not in citation given][need quotation to verify][need quotation to verify] Thus from the 4th century there existed unanimity in the West concerning the New Testament canon (as it is today), and by the 5th century the East, with a few exceptions, had come to accept the Book of Revelation and thus had come into harmony on the matter of the New Testament canon. Martin Luther (1483–1546) moved seven Old-Testament books (Tobit, Judith, 1-2 Maccabees, Book of Wisdom, Sirach, and Baruch) into a section he called the Apocrypha. To refer to these books without calling them "apocrypha," Catholic and Eastern Orthodox, and Oriental Orthodox later referred to them as the Deuterocanonicals—while still accepting their full canonicity. Luther removed the books of Hebrews, James, Jude and Revelation from the canon (partially because they were perceived to go against certain Protestant doctrines such as sola scriptura and sola fide), but this was not generally accepted among his followers. However, these books are ordered last in the German-language Luther Bible to this day. Final dogmatic articulations of the canons were made at the Council of Trent of 1546 for Roman Catholicism, the Thirty-Nine Articles of 1563 for the Church of England, the Westminster Confession of Faith of 1647 for Calvinism, and the Synod of Jerusalem of 1672 for the Eastern Orthodox. Other traditions, while also having closed canons, may not be able to point to an exact year in which their canons were complete. The following tables reflect the current state of various Christian canons. All of the major Christian traditions accept the books of the Hebrew protocanon in its entirety as divinely inspired and authoritative, in various ways and degrees. Furthermore, all of these traditions, with the exception of the Protestants, add to this number various deuterocanonical books. However, in some Protestant Bibles—especially the English King James Bible and the Lutheran Bible—many of these deuterocanonical books are retained as part of the tradition in a section called the "Apocrypha." Some books listed here, like the Testaments of the Twelve Patriarchs for the Armenian Apostolic Church, may have once been a vital part of a Biblical tradition, may even still hold a place of honor, but are no longer considered to be part of the Bible. Other books, like the Prayer of Manasseh for the Roman Catholic Church, may have been included in manuscripts, but never really attained a high level of importance within that particular tradition. The levels of traditional prominence for others, like Psalms 152–155 and the Psalms of Solomon of the Syriac churches, remain unclear. In so far as the Oriental Orthodox Tewahedo canon is concerned, some points of clarity should be made. First, the books of Lamentations, Jeremiah, and Baruch, as well as the Letter of Jeremiah and 4 Baruch, are all considered canonical by the Orthodox Tewahedo Churches. However, it is not always clear as to how these writings are arranged or divided. In some lists, they may simply fall under the title "Jeremiah", while in others, they are divided in various ways into separate books. Moreover, the book of Proverbs is divided into two books—Messale (Prov. 1–24) and Tägsas (Prov. 25–31). Josephus' Jewish War VI No No No No No No No No No – inc. in some mss. [O 13] No No No – inc. in some mss. Psalms 152–155 No No No No No No No No Yes (?) No No No (?) – inc. in some mss. Psalms of Solomon[O 16] No No No No No – inc. in some mss. No No No No – inc. in some mss. No No No – inc. in some mss. (2 Baruch 1–77)[O 27] No No No No No No No No Yes (?) No No No (?) – inc. in some mss. ^ The term "Protestant" is not accepted by all Christian denominations who often fall under this title by default—especially those who view themselves as a direct extension of the New Testament church. However, the term is used loosely here to include most of the non-Roman Catholic Protestant, Charismatic/Pentecostal, Reformed, and Evangelical churches. Other western churches and movements that have a divergent history from Roman Catholicism, but are not necessarily considered to be historically Protestant, may also fall under this umbrella terminology. ^ The growth and development of the Armenian Biblical canon is complex. Extra-canonical Old Testament books appear in historical canon lists and recensions that are either exclusive to this tradition, or where they do exist elsewhere, never achieved the same status. These include the Deaths of the Prophets, an ancient account of the lives of the Old Testament prophets, which is not listed in this table. (It is also known as the Lives of the Prophets.) Another writing not listed in this table entitled the Words of Sirach—which is distinct from Ecclesiasticus and its prologue—appears in the appendix of the 1805 Armenian Zohrab Bible alongside other, more commonly known works. ^ Adding to the complexity of the Orthodox Tewahedo Biblical canon, the national epic Kebra Negast has an elevated status among many Ethiopian Christians to such an extent that some consider it to be inspired scripture. ^ a b c The Prayer of Manasseh is included as part of the Book of Odes, which follows the Psalms in Eastern Orthodox Bibles. The rest of the Book of Odes consists of passages found elsewhere in the Bible. ^ a b A Syriac version of Josephus's Jewish War VI appears in some Peshitta manuscripts as the "Fifth Book of Maccabees," which is clearly a misnomer. ^ Several varying historical canon lists exist for the Orthodox Tewahedo tradition. In one particular list found in a British Museum manuscript (Add. 16188), a book of Assenath is placed within the canon. This most likely refers to the book more commonly known as Joseph and Asenath. An unknown book of Uzziah is also listed there, which may be connected to the lost Acts of Uziah referenced in 2 Chronicles 26:22. ^ In many ancient manuscripts, a distinct collection known as the Odes of Solomon is found together with the similar Psalms of Solomon. ^ Bel and the Dragon, Susanna, & The Prayer of Azariah and Song of the Three Holy Children. Among the various Christian denominations, the New Testament canon is a generally agreed-upon list of 27 books. However, the way in which those books are arranged may vary from tradition to tradition. For instance, in the Slavonic, Orthodox Tewahedo, Syriac, and Armenian traditions, the New Testament is ordered differently from what is considered to be the standard arrangement. Protestant Bibles in Russia and Ethiopia usually follow the local Orthodox order for the New Testament. The Syriac Orthodox Church and the Assyrian Church of the East both adhere to the Peshitta liturgical tradition, which historically excludes five books of the New Testament Antilegomena: 2 John, 3 John, 2 Peter, Jude, and Revelation. However, those books are included in certain Bibles of the modern Syriac traditions. Other New Testament works that are generally considered apocryphal nonetheless appear in some Bibles and manuscripts. For instance, the Epistle to the Laodiceans[note 5] was included in numerous Latin Vulgate manuscripts, in the eighteen German Bibles prior to Luther's translation, and also a number of early English Bibles, such as Gundulf's Bible and John Wycliffe's English translation—even as recently as 1728, William Whiston considered this epistle to be genuinely Pauline. Likewise, the Third Epistle to the Corinthians[note 6] was once considered to be part of the Armenian Orthodox Bible, but is no longer printed in modern editions. Within the Syriac Orthodox tradition, the Third Epistle to the Corinthians also has a history of significance. Both Aphrahat and Ephraem of Syria held it in high regard and treated it as if it were canonical. However, it was left-out of the Peshitta and ultimately excluded from the canon altogether. The Didache,[note 7] The Shepherd of Hermas,[note 8] and other writings attributed to the Apostolic Fathers, were once considered scriptural by various early Church fathers. They are still being honored in some traditions, though they are no longer considered to be canonical. However, certain canonical books within the Orthodox Tewahedo traditions find their origin in the writings of the Apostolic Fathers as well as the Ancient Church Orders. The Orthodox Tewahedo churches recognize these eight additional New Testament books in its broader canon. They are as follows: the four books of Sinodos, the two books of the Covenant, Ethiopic Clement, and the Ethiopic Didascalia. ^ The growth and development of the Armenian Biblical canon is complex. Extra-canonical New Testament books appear in historical canon lists and recensions that are either distinct to this tradition, or where they do exist elsewhere, never achieved the same status. Some of the books are not listed in this table. These include the Prayer of Euthalius, the Repose of St. John the Evangelist, the Doctrine of Addai (some sources replace this with the Acts of Thaddeus), a reading from the Gospel of James (some sources replace this with the Apocryphon of James), the Second Apostolic Canons, the Words of Justus, Dionysius Aeropagite, the Acts of Peter (some sources replace this with the Preaching of Peter), and a Poem by Ghazar. (Various sources also mention undefined Armenian canonical additions to the Gospels of Mark and John, however, these may refer to the general additions—Mark 16:9–20 and John 7:53–8:11—discussed elsewhere in these notes.) A possible exception here to canonical exclusivity is the Second Apostolic Canons, which share a common source—the Apostolic Constitutions—with certain parts of the Orthodox Tewahedo New Testament broader canon. The correspondence between King Agbar and Jesus Christ, which is found in various forms—including within both the Doctrine of Addai and the Acts of Thaddeus—sometimes appears separately (see this list). It is noteworthy that the Prayer of Euthalius and the Repose of St. John the Evangelist appear in the appendix of the 1805 Armenian Zohrab Bible. However, some of the aforementioned books, though they are found within canon lists, have nonetheless never been discovered to be part of any Armenian Biblical manuscript. A 21st-century artistic representation of the Golden Plates with Urim and Thummim. The manuscripts of the unfinished Joseph Smith Translation of the Bible (JST) state that "the Song of Solomon is not inspired scripture." However, it is still printed in every version of the King James Bible published by the church. The Standard Works are printed and distributed by the LDS church in a single binding called a "Quadruple Combination" or a set of two books, with the Bible in one binding, and the other three books in a second binding called a "Triple Combination". Current editions of the Standard Works include a bible dictionary, photographs, maps and gazetteer, topical guide, index, footnotes, cross references, excerpts from the Joseph Smith Translation of the Bible and other study aids. Canons of various Latter Day Saint denominations diverge from the LDS Standard Works. Some accept only portions of the Standard Works. For instance, the Bickertonite sect does not consider the Pearl of Great Price or Doctrines and Covenants to be scriptural. Rather, they believe that the New Testament scriptures contain a true description of the church as established by Jesus Christ, and that both the King James Bible and Book of Mormon are the inspired word of God. Some denominations accept earlier versions of the Standard Works or work to develop corrected translations. Others have purportedly received additional revelation. The Community of Christ points to Jesus Christ as the living Word of God, and it affirms the Bible, along with the Book of Mormon, as well as its own regularly appended version of Doctrines and Covenants as scripture for the church. While it publishes a version of the Joseph Smith Translation—which includes material from the Book of Moses—the Community of Christ also accepts the use of other translations of the Bible, such as the standard King James Version and the New Revised Standard Version. Like the aforementioned Bickertonites, the Church of Christ (Temple Lot) rejects the Doctrine and Covenants and the Pearl of Great Price, as well as the Joseph Smith Translation of the Bible, preferring to use only the King James Bible and the Book of Mormon as doctrinal standards. The Book of Commandments is accepted as being superior to the Doctrine and Covenants as a compendium of Joseph Smith's early revelations, but is not accorded the same status as the Bible or Book of Mormon. The Word of the Lord and The Word of the Lord Brought to Mankind by an Angel are two related books considered to be scriptural by certain (Fettingite) factions that separated from the Temple Lot church. Both books contain revelations allegedly given to former Church of Christ (Temple Lot) Apostle Otto Fetting by an angelic being who claimed to be John the Baptist. The latter title (120 messages) contains the entirety of the former's material (30 msgs.) with additional revelations (90 msgs.) purportedly given to William A. Draves by this same being, after Fetting's death. Neither are accepted by the larger Temple Lot body of believers. The Church of Jesus Christ of Latter Day Saints (Strangite) considers the Bible (when correctly translated), the Book of Mormon, and editions of the Doctrine and Covenants published prior to Joseph Smith's death (which contained the Lectures on Faith) to be inspired scripture. They also hold the Joseph Smith Translation of the Bible to be inspired, but do not believe modern publications of the text are accurate. Other portions of The Pearl of Great Price, however, are not considered to be scriptural—though are not necessarily fully rejected either. The Book of Jasher was consistently used by both Joseph Smith and James Strang, but as with other Latter Day Saint denominations and sects, there is no official stance on its authenticity, and it is not considered canonical. An additional work called The Book of the Law of the Lord is also accepted as inspired scripture by the Strangites. They likewise hold as scriptural several prophecies, visions, revelations, and translations printed by James Strang, and published in the Revelations of James J. Strang. Among other things, this text contains his purported "Letter of Appointment" from Joseph Smith and his translation of the Voree plates. The Church of Jesus Christ (Cutlerite) accepts the following as scripture: the Inspired Version of the Bible (including the Book of Moses and Joseph Smith–Matthew), the Book of Mormon, and the 1844 edition of the Doctrine and Covenants (including the Lectures on Faith). However, the revelation on tithing (section 107 in the 1844 edition; 119 in modern LDS editions) is emphatically rejected by members of this church, as it is not believed to be given by Joseph Smith. The Book of Abraham is rejected as scripture, as are the other portions of the Pearl of Great Price that do not appear in the Inspired Version of the Bible. Many Latter Day Saint denominations have also either adopted the Articles of Faith or at least view them as a statement of basic theology. (They are considered scriptural by the larger LDS church and are included in The Pearl of Great Price.) At times, the Articles have been adapted to fit the respective belief systems of various faith communities. ^ For a fuller discussion of issues regarding the canonicity of Enoch, see the Reception of Enoch in antiquity. ^ Josephus's The Jewish War and Antiquities of the Jews are highly regarded by Christians because they provide valuable insight into 1st century Judaism and early Christianity. Moreover, in Antiquities, Josephus made two extra-Biblical references to Jesus, which have played a crucial role in establishing him as a historical figure. ^ A translation of the Epistle to the Laodiceans can be accessed online at the Internet Sacred Texts Archive. ^ The Third Epistle to the Corinthians can be found as a section within the Acts of Paul, which has survived only in fragments. A translation of the entire remaining Acts of Paul can be accessed online at Early Christian Writings. ^ Various translations of the Didache can be accessed online at Early Christian Writings. ^ A translation of the Shepherd of Hermas can be accessed online at the Internet Sacred Texts Archive. ^ Ulrich, Eugene (2002). "The Notion and Definition of Canon". In McDonald, L. M.; Sanders, J. A. (eds.). The Canon Debate. Hendrickson Publishers. pp. 29, 34. Ulrich's article defines "canon" as follows: "...the definitive list of inspired, authoritative books which constitute the recognized and accepted body of sacred scripture of a major religious group, that definitive list being the result of inclusive and exclusive decisions after a serious deliberation". It is further defined[by whom?] as follows: "...the definitive, closed list of the books that constitute the authentic contents of scripture." ^ Ulrich (2002), p. 28. "The term is late and Christian ... though the idea is Jewish". ^ Athanasius. Letter 39.6.3. "Let no man add to these, neither let him take ought from these." ^ Ulrich (2002), pp. 30, 32–33. "But it is necessary to keep in mind Bruce Metzger's distinction between "a collection of authoritative books" and "an authoritative collection of books." ^ For the number of books of the Hebrew Bible see: Darshan, G. (2012). "The Twenty-Four Books of the Hebrew Bible and Alexandrian Scribal Methods". In Niehoff, M. R. (ed.). Homer and the Bible in the Eyes of Ancient Interpreters: Between Literary and Religious Concerns. Leiden: Brill. pp. 221–44. ^ McDonald & Sanders (2002), p. 4. ^ W. M., Christie. "The Jamnia Period in Jewish History" (PDF). Journal of Theological Studies. os-XXVI (104): 347–64. ^ Freedman, David Noel, ed. (1992). Anchor Bible Dictionary, Vol. III. New York: Doubleday. pp. 634–37. ^ Lewis, Jack P. (2002). "Jamnia Revisited". In McDonald, L. M.; Sanders, J. A. (eds.). The Canon Debate. Hendrickson Publishers. ^ McDonald & Sanders (2002), p. 5. ^ Brettler, Marc Zvi (2005). How To Read The Bible. Jewish Publication Society. pp. 274–75. ISBN 978-0-8276-1001-9. ^ Blenkinsopp, Joseph (2002). "The Formation of the Hebrew Canon: Isaiah as a Test Case". In McDonald, L. M.; Sanders, J. A. (eds.). The Canon Debate. Hendrickson Publishers. p. 60. ^ Davies, Philip R. (2002). "The Jewish Scriptural Canon in Cultural Perspective". In McDonald, L. M.; Sanders, J. A. (eds.). The Canon Debate. Hendrickson Publishers. p. 50. With many other scholars, I conclude that the fixing of a canonical list was almost certainly the achievement of the Hasmonean dynasty. ^ VanderKam, James C. (2002). "Questions of Canon through the Dead Sea Scrolls". In McDonald, L. M.; Sanders, J. A. (eds.). The Canon Debate. Hendrickson Publishers. p. 94. Citing private communication with Emanuel Tov on biblical manuscripts: Qumran scribe type c.25%, proto-Masoretic Text c. 40%, pre-Samaritan texts c. 5%, texts close to the Hebrew model for the Septuagint c. 5% and nonaligned c. 25%. ^ Sanders, J. A. (2002). "The Issue of Closure in the Canonical Process". In McDonald, L. M.; Sanders, J. A. (eds.). The Canon Debate. Hendrickson Publishers. p. 259. ... the so-called Septuagint was not in itself formally closed. Attributed to Albert Sundberg's 1964 Harvard dissertation. ^ Ferguson, Everett (2002). "Factors leading to the Selection and Closure of the New Testament Canon". In McDonald, L. M.; Sanders, J. A. (eds.). The Canon Debate. Hendrickson Publishers. pp. 302–03 ; cf. Justin Martyr. First Apology. 67.3. ^ Metzger, Bruce (1997). The Canon of the New Testament. Oxford University Press. p. 98. The question whether the Church's canon preceded or followed Marcion's canon continues to be debated. ^ a b von Harnack, Adolf (1914). "Appendix VI". Origin of the New Testament. ^ Ferguson (2002), p. 301; cf. Irenaeus. Adversus Haereses. 3.11.8. ^ de Jonge, H. J. (2003). "The New Testament Canon". In de Jonge, H. J.; Auwers, J. M. (eds.). The Biblical Canons. Leuven University Press. p. 315. ^ Prat, Ferdinand (1911). "Origen and Origenism". The Catholic Encyclopedia, Vol. 11. New York: Robert Appleton Company. According to Eusebius' Church History 6.25: a 22 book OT [though Eusebius doesn't name Minor Prophets, presumably just an oversight?] + 1 DeuteroCanon ["And outside these are the Maccabees, which are entitled S<ph?>ar beth sabanai el."] + 4 Gospels but on the Apostle "Paul ... did not so much as write to all the churches that he taught; and even to those to which he wrote he sent but a few lines." ^ Metzger (1997), p. 141. ^ Ekonomou, Andrew J. (2007). Byzantine Rome and the Greek Popes. Lexington Books. p. 222. ISBN 978-0-73911977-8. ^ Schaff, Philip; Wace, Henry (eds.). "Council in Trullo". Nicene and Post-Nicene Fathers, Second Series, Vol. 14. ^ Ferguson (2002), p. 320; Bruce, F. F. (1988). The Canon of Scripture. Intervarsity Press. p. 230. ; cf. Augustine. De Civitate Dei. 22.8. ^ Bruce (1988), p. 234. ^ Bruce (1988), p. 225. ^ "Innocent I". Bible Research. Retrieved 21 May 2016. ^ Bruce (1988), p. 215. ^ Ackroyd & Evans (1970), p. 305; compare: Reid, George (1908). "Canon of the New Testament". Catholic Encyclopedia. Robert Appleton Company. ^ Rohmann, Dirk (2016). Christianity, Book-Burning and Censorship in Late Antiquity: Studies in Text Transmission. Arbeiten zur Kirchengeschichte. 135. Walter de Gruyter GmbH & Co KG. ISBN 9783110485554. Retrieved 11 April 2018. Prudentius [348-c. 410] [...] intends to demonstrate the superiority of Christianity and was likely aware that at this time the Bible has not replaced other books as much as he wants to think. This passage also presents a possible hint that old Latin translations were replaced with a new canonical version, perhaps alluding to the Vulgate, written by Jerome at the end of the fourth century. By implication, this suggests that uncanonical texts were unlikely to be transcribed - an ideologically and authoritatively endorsed selection process that comes close to modern understandings of censorship. ^ "German Bible Versions". Bible Research. ^ "The Bible". Ethiopian Orthodox Tewahedo Church. 2003. Retrieved 20 January 2012. ^ Saifullah, M. S. M. "Canons & Recensions of the Armenian Bible". Islamic Awareness. Retrieved 25 January 2012. ^ Metzger (1997), pp. 219, 223; cf. 7, 176, 182. Cited in Epp, Eldon Jay (2002). "Issues in the Interrelation of New Testament Textual Criticism and Canon". In McDonald, L. M.; Sanders, J. A. (eds.). The Canon Debate. Hendrickson Publishers. p. 492. ^ Cowley, R. W. (1974). "The Biblical Canon of the Ethiopian Orthodox Church Today". Ostkirchliche Studien. 23: 318–23. ^ Burris, Catherine; van Rompay, Lucas (2002). "Thecla in Syriac Christianity: Preliminary Observations". Hugoye: Journal of Syriac Studies. 5 (2): 225–36. Archived from the original on 1 July 2016. Retrieved 21 May 2016. ^ "Song of Solomon". Bible Dictionary. The Church of Jesus Christ of Latter-Day Saints. p. 776. ^ Sheldon, William. "A Synopsis of the Church of Christ Beliefs and Practices as Compared to Other Latter Day Saint Churches". The Interactive Bible. Refers to the Bible and Book of Mormon as "the only safe standards". ^ "Strangite Scriptures" Archived 21 October 2013 at Archive-It. Strangite.org. Retrieved 3 March 2012. Childs, Brevard S.. (1984). The New Testament as Canon: An Introduction. SCM Press. ISBN 0-334-02212-6.